In this Service I am offering you a guest post opportunity on Thriveglobal.com. 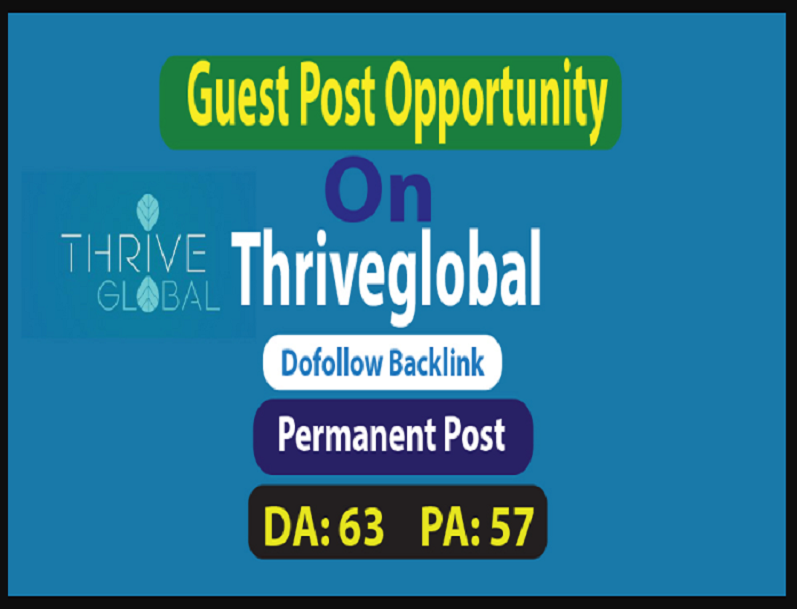 The Thriveglobal is a high ranked US-based premium site.Which having high DA PA.
\r\nIf you make a guest post on this site you can get a huge visitor and its dofollow link will help to increase your site domain authority. \r\nIf you order on Basic package you have to send me a fresh genuine content and It must need to be more than 500 words. \r\nIf you have not content just order hourlie extras. \r\nSo don\'t miss this guest post opportunity on Thriveglobal. \r\nNote: For living post thriveglobal take more than 25 day. \r\n100% satisfaction and money back guarantee. \r\nPlease contact me If you have any question. \r\nNote: This is only for posting price. If you want write with high Quality content then check extra service and Must provide high quality content otherwise thriveglobal will rejected the content.